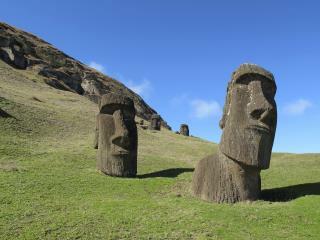 (Newser) – The tale of the demise of Easter Island's people may have to be rewritten. The story has long held that infighting as resources ran out was one of the main drivers of the collapse, but a new study published in the Journal of Pacific Archaeology suggests a different scenario. CNN reports on the "unlikely method" of examining the society via of some of the stone tools used to carve the island's famous stone figures: Researchers performed a chemical analysis on four of the statues and fragments from 17 of the roughly 1,600 basalt tools, called toki, that had been excavated. The goal was to determine where the basalt had come from. There were three quarries on the island that were potential sources of the volcanic rock; the key discovery is that there was "near exclusive" use of a single quarry to make the toki. The topics of ancient megaliths cause a keen interest among people. The scientists gare getting off with some silly assumptions. I like the work of a group of volunteers who made a bold assumption about the existence of a single information field and that people used megalithic structures to transmit information through this field. https://allatra.tv/en/video/narushaja-zakony-fiziki-otkrytyj-jeksperiment-piramida-o-vozmozhnosti-nevozmozhnogo This video tells about the unique Pyramid apparatus, through which research is conducted. Well, if scientists are not ready to answer our questions, we'll do it ourselves. I think there are possibilities the people died of some disease or they migrated off of the island. It should be easy to prove. Ah, hell, just apply for another $20 million grant and go do your mushrooms on that island for another 4 years. What a bunch of B.S. Who give a flying f--- anyway?